I’m looking forward to 2017. Seems the older I get, the happier I am to greet a new year. This year has been a challenge for me and honestly, I won’t be sorry to see it end. I’m ready for a fresh start and a clean slate. So…to welcome 2017 a little early, I’m introducing my 2017 free printable monthly calendar. It includes the year-at-a-glance, monthly calendars, a weekly planner and a weekly menu planner. Lastly, I included an inspirational printable. You can use this any way you choose, but I thought it would be a nice cover if you put your calendar in a binder with a clear pocket on the front. There are lots of ways you can organize yourself and your calendar. I chose to get a binder and monthly divider tabs. I printed the year-at-a-glance and monthly calendars on card stock so they would hold up a little better. I printed four weekly planners for each month. (More on that later.) I also printed the weekly menu planners but I don’t think I will keep those in my binder. I make my grocery list in the kitchen, so I plan to keep a menu planner stuck on the refrigerator with a magnet. The only office supply store in my area is Staples, so when I was looking for a binder I stopped in to see what they had. I found cute Studio C binders in several different patterns. I chose a blue geometric with polka dots inside. They are not available on their website but most stores carry them. I have linked to two similar binders in my source section below. 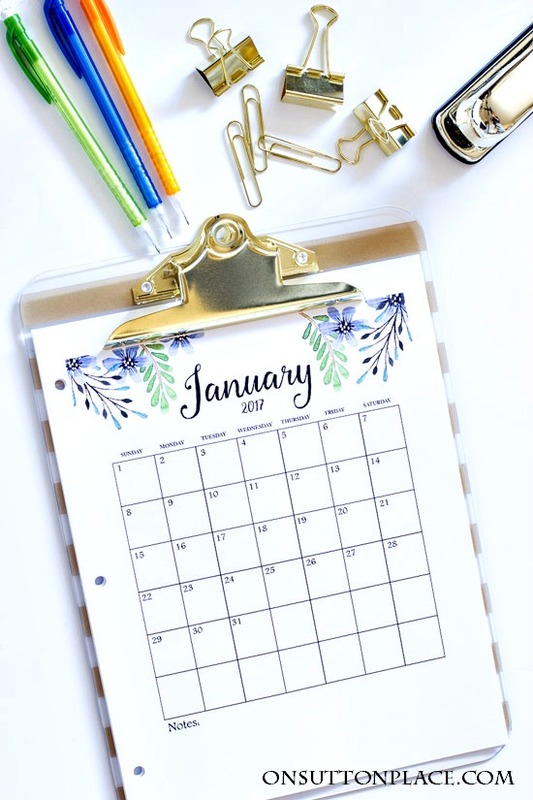 Another way to use the 2017 free printable monthly calendar is to keep it on a clipboard. It could hang on a bulletin board…or it could hang on the wall of your command center/drop zone. The weekly planners are very basic but they will do the trick. I have used the 2016 weekly planner all year and it has saved me several times. I didn’t print ahead and there were times I wish I had…so I am printing 52 weekly planners for 2017. That way if there’s something to keep track of down the line, I will be ready. The printable is really just to make you smile whenever you use your calendar. No one knows better than me that we can’t shine every single day…but on the days you feel dull and flat, maybe just seeing these words will help. Sometimes all it takes is one kind word to flip your day from bad to good. I hope the printable does that. Once you click the button below, you will be taken to box.com and can download the 2017 free printable monthly calendar 16 page PDF. It’s a large, high resolution file so it may take a minute or two to download all the way. Please let me know if you have any trouble at all and I will help any way I can. I hang a weekly shopping list and menu plan on my refrigerator but usually its on plain scrap paper. 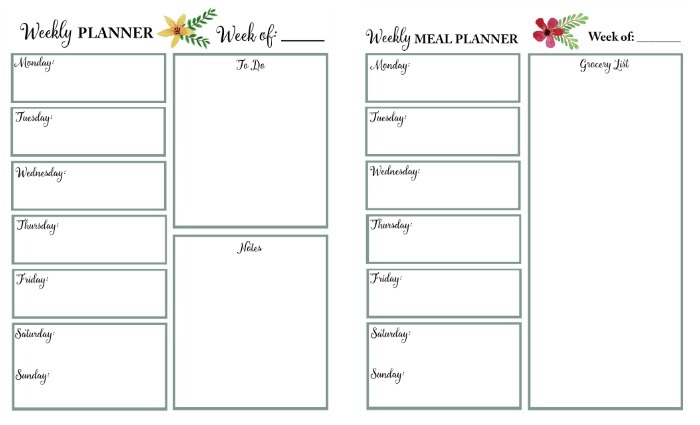 Your weekly menu planner is a lot prettier. Thanks for sharing with us! Oh my goodness you have just saved me a ton of work for my journal. Lovely … THANK YOU SO VERY MUCH! This is a great tool I am a school teacher and am so excited to have this calendar to add to my planner. I am looking forward to getting the 2018 year as well. Thank you so much for this amazing calendar/weekly menu!!! Such a beautiful font & perfectly floral. I have just discovered On Sutton Place and feel as if I’ve found an old friend. Your creative style speaks to my heart. I am looking forward to using this calendar, and making some simple adjustments to my home to create a space that speaks more of me. Thanks, Ann, for your inspiration! Thank you so much for this AMAZING calendar ! I really liked them & also they were very useful to me . I can’t wait to pick up some cardstock!!! This is a fantastic calendar idea and I can’t wait to get started. Love love love the look.. Thanks a million!! Thank you so much for posting the calendar, it looks amazing . LOVE THIS!!! Thank you so much for sharing! Thanks so much for sharing!!!! They are very beautiful !! Thanks for sharing! it is sooo beautiful!! Thanks for sharing this beautiful calendar! you are Awesome and so talented!! I look forward to all of your beautiful pictures, sayings and calendars! Your job is so beautiful! This monthly calendar is perfect! There is a blue download button towards the end of the post. Just click that and you can download the entire file. Enjoy! Beautiful, and just what I was looking for. Thank you. I love this calendar! So beautiful. THANK YOU!! This is beautiful! Thanks so much! Hope y0u have a great 2017! Hello Ann! Thank you very much for sharing this beautiful calendar. I love it! Simply and beautifully designed. Thanks for make it free! 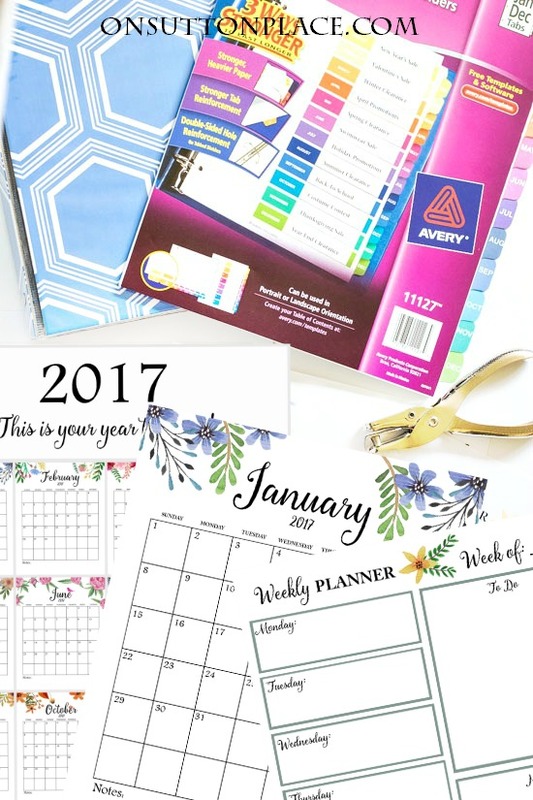 I’ve been looking for free 2017 Printable Calendar and I find yours is the best. Thank you for sharing. More blessings coming your way. i will definitely hang this on our wall. Thanks! 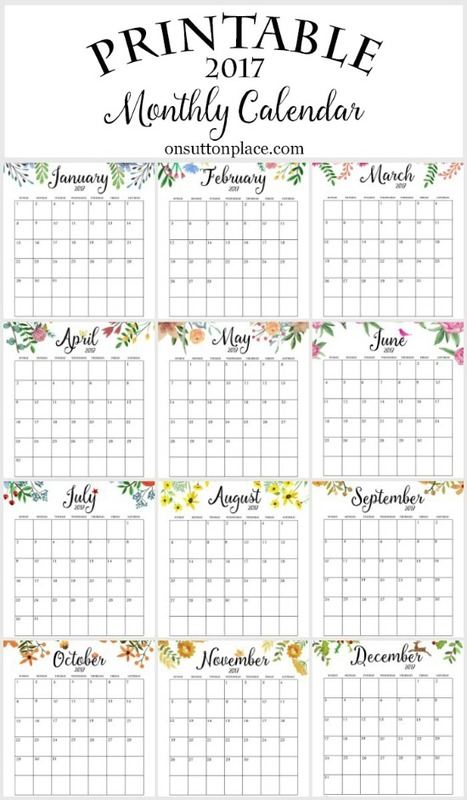 Thank you for the free printables calendar. It’s very pretty and I am sure I will find it useful. My only resolution this year is to be more organized. Merry Christmas!! Love this 2017 gift! How thoughtful of you to give your followers such a lovely gift, which will remind me of you all year long. Thank you for this FREE PRINTABLES PLANNER it is very useful specially for us working moms. Merry Christmas and have a Blessed New Year. This calendar is so perfect… I love it! Ann, I must say this is truly one of the most beautiful calendars I have seen for the coming year. I can feel the sweet love that went into making the colors just right as it is truly ‘beautiful’. Your generosity is well received and many blessings back to you through your gift to all of us out here in internet land. I can just tell your one amazing and giving lady. Hugs to you from Vancouver, USA. God bless!! I want to ask if you deleted the templates because I can’t download it. Hopefully you can fix it because I really like it. Beautiful calendar and weekly planners!! Thanks for sharing! Thanks ever so much for this- it’s so pretty! I really appreciate the weekly spread and the meal planner too, and I love the idea of using the printable as spot motivation for rougher days. Your printables are just beautiful!!! I was wondering if your going to make you little grain sack stockings this year? I bought some last year and I wanted more. They are just so pretty on a little Christmas tree. I am not doing any sewing right now. I have my hands full with everything else but I hope at some point to get back into my sewing room. I do miss it…thank you for asking. Happy Holidays! Hi Ann, I was wondering if you could recommend a printer…you have such great printables. When I print them at home they are not as crisp and bright as I would like. You are wonderfully creative and generous and I appreciate you and your site very much. Have a wonderful Thanksgiving. Of course if you want to spend a little more, a color laser printer would do a beautiful job. We had one at the school where I used to work and they make very clear, crisp copies. I hope this helps! Ann, I love your blog!! I’ve been following you off and on for years but recently subscribed and began following you daily. Our tastes are similar. When I see your emails in my inbox, I know something special is waiting. Thanks for all you do! The calendar pages are beautiful! I decided not to wait till 2017, I printed out some weekly planners and menu planners and am already using them. I look forward to the new year and each monthly calendar, what a lovely way to stay organized. Thank you so much for creating and sharing these sweet printables! Thank you for another beautiful calendar. Thank you for the beautiful calendars! Downloaded calendar with no problems! Great idea for Weekly & Meal planners as well. 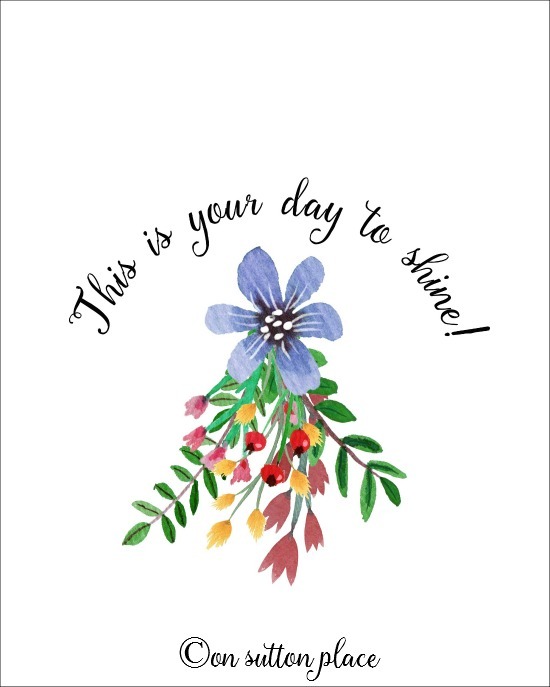 Thank you so much for the beautiful calendar and especially the printable, “This is you day to shine”. I will frame mine and think of you. Ann, how very generous of you to share your beautiful and well thought out calendar! It fits my needs perfectly. It is right in line with the quality of everything you post. In fact, I’m going to start using the Weekly Planner and Meal Planner immediately. I know 2017 is going to be a fantastic and blessed year for you! Thank you for this beautiful planner and calendar. I was happy to be able to print the entire year – this will make planning so much easier. I am excited to make my own planner using your great designs instead of using a store bought planner. Oh, Ann, these calendars are simply gorgeous & I, too, am looking forward to the new year. I lost my Mother 3 months ago & have gone through a lot of emotions since then. 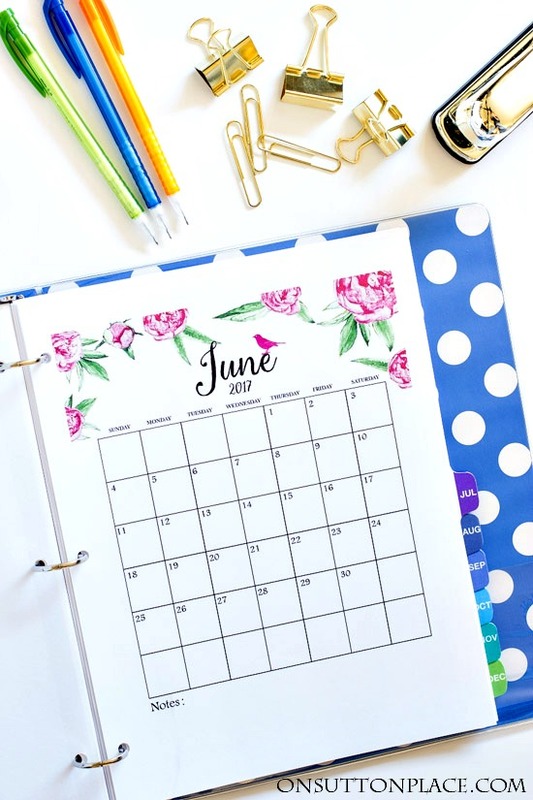 Your monthly planner is beautiful & can’t wait to put new dates, new events, etc. onto them. Having something new & refreshing to look to in the near future. Thank you again, for sharing! this year has flown by for us…we made a big move from CO back to AZ….sold our home there then bought one here and just finished a 4 month remodel….bringing the house from 1994 into 2016……so it’s been a year…. Thank you so much!!!!! I am always looking for a calendar like this one. I really appreciate your kindness! Thank you so much for sharing. The flowers are so pretty. I love all your organization ideas. Have a wonderful Thanksgiving and Merry Christmas to you and your family. What a lovely gift. I am always searching for the best planner. Right now I noticed that the one I have used in the past is now very, I mean really expensive. I just can’t do it. Your version is very similar and I know it will work for me. Thank you so much, it is very generous to offer this to your readers. I have years and years of planners, full of notes and anecdotes. I have one from 5 years ago that was the worst year of my life. I continue to check it now and then to see just what happened what day, and see how far I have come. A long journey from darkness and I am so, so glad I recorded it all. Thanks again, and Happy New Year to you. 2017 will see lots of positive entering your life because of your generosity! Thank you! Beautiful is only way I can describe this. Like you, as I get older enjoy the upcoming new year, waiting with anticipation of what’s around the corner. Ann so pretty! I especially like the weekly and meal planners. I can’t wait to see all you have in store for us over the next few weeks. Thanks for all you do! make me smile every day for the entire year. Mary…this comment not only made me smile but it totally made my day. Thank you for taking the time to write…Happy Holidays! The monthly calendars and inspirational poster are so wonderful and so very generous of you. Thank you so much! Thanks so much.. It is gorgeous. You are so talented, dear Ann, and so generous! These are just beautiful! Everything is just lovely, Ann. Thank you so very much for your generous printable. I.Love.It! Ann, I’m sure you have spent many hours creating the calendar…the end result is magnificent! You are quite talented, in so many ways. Thank you! I look forward to more emails from you and hope for you and yours a very Happy Thanksgiving! I look forward always to seeing “annsutton” in my in mail. It’s like a present every time. So let me say thanks. You are such an inspiration to me and I’m praying the new year will be better for you and all of us. Thanks for being so creative and sharing with those of us who are not so creative. You make me look good when my friends say what a good idea or I love what you’ve done. Can’t wait to do this calendar. Love calendars and maps. Thanks ever so much for sharing these calendars etc, they will be an excellent source for the new year. The flowers are beautiful and they did make me smile. I too am looking forward to a change. Happy Thanksgiving, Anne.